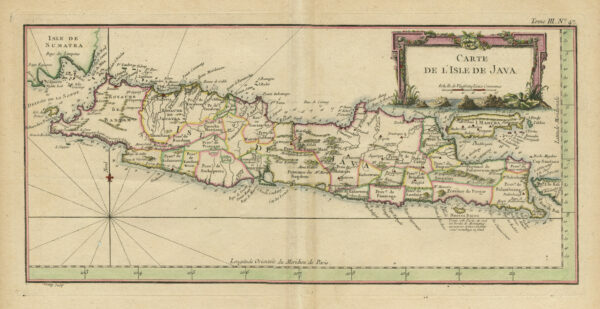 Antique map Java by Bellin titled ‘Carte de l’Lisle de Java’. 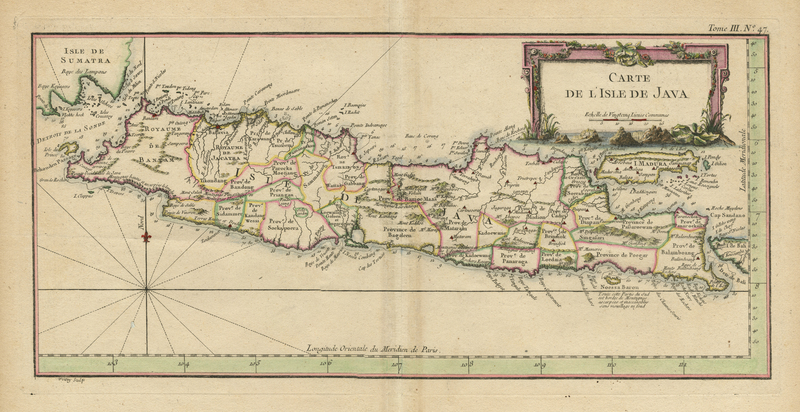 Fine engraved colored map of the island of Java, published in Jacques Nicolas Bellin’s Le Petit Atlas Maritime Recueti de Cartes et Plans des Quatre Parlies du Monde en Cinq Volumes, in Paris in 1764. Bellin (1703-1772) is among the most important mapmakers of the 18th Century. In 1721, at age 18, he was appointed hydrographer (chief cartographer), to the French Navy. In August 1741, he became the first Ingénieur de la Marine of the Depot des cartes et plans de la Marine (the French Hydrographical Office), and was named Official Hydrographer of the French King. During his term as Official Hydrographer, the Depot was the single most active center for the production of sea charts and maps, including a large folio format sea-chart of France, the Neptune Francois. He also produced a number of sea-atlases of the world, e.g., the Atlas Maritime and the Hydrographie Francaise. These gained fame, distinction and respect all over Europe and were republished throughout the 18th and even in the succeeding century. Bellin also came out with smaller format maps such as the 1764 Petit Atlas Maritime, containing 580 finely detailed charts. He also contributed many of the maps for Bellin and contributed a number of maps to the 15 volume Histoire Generale des Voyages of Antoine François Prévost or simply known l’Abbe Prevost. Bellin set a very high standard of workmanship and accuracy, thus gaining for France a leading role in European cartography and geography. Many of his maps were copied by other mapmakers of Europe.